Provided photo FFA chapter officer Alex Isbrandt distributes a tree to a fourth-grade student at Miami East Elementary. All fourth graders received a tree from the FFA as part of a project from the Miami Soil and Water and Troy Foundation. 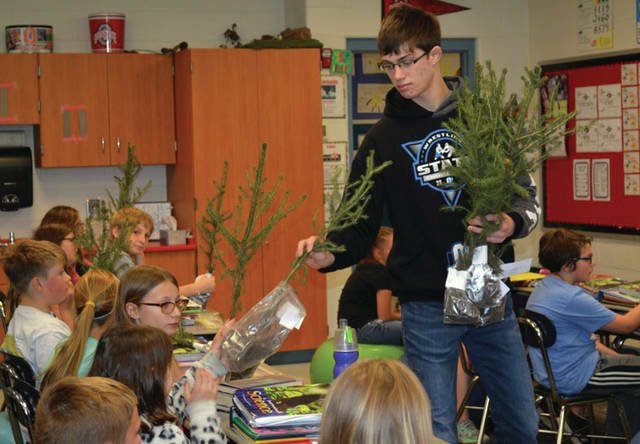 CASSTOWN — The Miami East-MVCTC FFA Chapter recently donated trees to every fourth grader in the Miami East Local School District. This was a special project of the FFA’s Environmental Committee of the FFA with the help of all Agriculture, Food, and Natural Resources students and several members of the Chapter Officer Team. The trees were distributed in the classrooms of Mrs. Kathryn Irick, Mr. Josh Roeth, Mr. Matt Roth and Mrs. Brittany Scarpella. All students were challenged to plant their tree in celebration of Earth Day. Earth Day is an annual event, celebrated on Saturday, April 22, on which events are held worldwide to demonstrate support for environmental protection. It was first celebrated in 1970, and is now coordinated globally by the Earth Day Network and celebrated in more than 192 countries each year. Additional participants of this project were Katie Bodenmiller, Alex Isbrandt, Emma Linn, Emily Thimmes and Alyssa Westgerdes. The trees were a project with the Miami County Soil and Water Conservation District and the Troy Foundation. https://www.dailycall.com/wp-content/uploads/sites/30/2017/04/web1_Alex-Isbrandt.jpgProvided photo FFA chapter officer Alex Isbrandt distributes a tree to a fourth-grade student at Miami East Elementary. All fourth graders received a tree from the FFA as part of a project from the Miami Soil and Water and Troy Foundation.